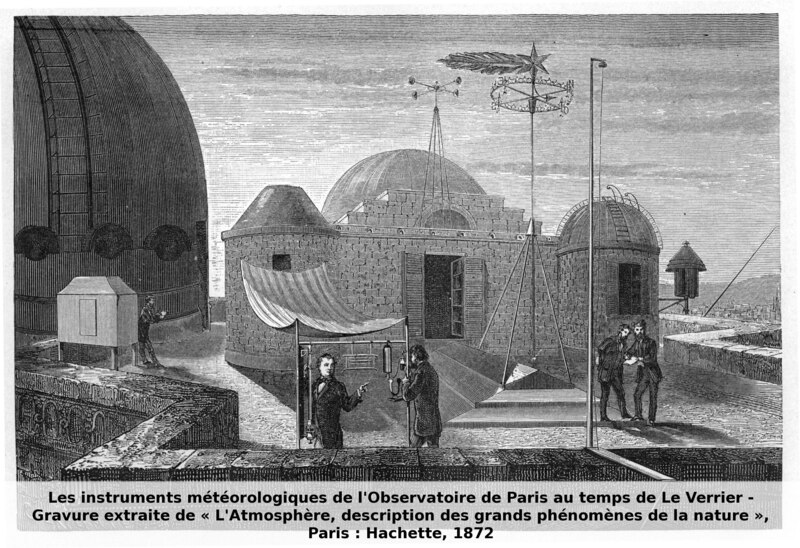 An almost obligatory concern of astronomers who look at the sky, meteorology became a national service during the 19th century. The first maps and predictions for France were published by the Observatory, and an international collaboration was set up. On the 14th of November 1854, a violent storm destroyed many French warships, including the Admiral’s, which were besieging Sebastopol. Shocked by this catastrophe, Napoleon III asked Le Verrier if it would not be possible to predict the arrival of storms. Why Le Verrier? Because the study of meteorology had always been considered to fall within the astronomer’s terrain. The inquest he organized showed that the perturbation responsible for the storm had taken several days to move from the Atlantic to the Black Sea, and that it would in fact have been possible to predict its arrival had it been possible to transmit to a central point meteorological data gathered along its trajectory. 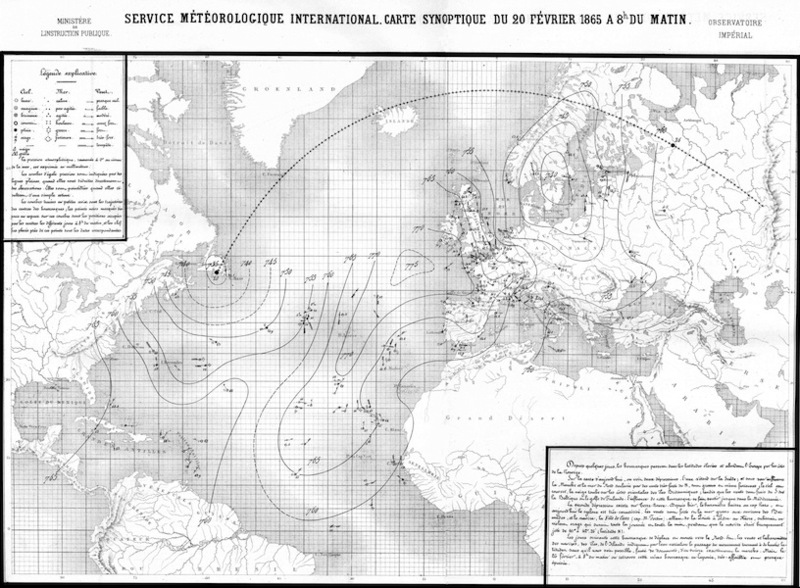 Taking advantage of the development of the electric telegraph, Le Verrier created a national, then international, meteorological service: the meteorological data were measured every morning in many towns and telegraphed to the Paris Observatory, where they were combined to make true meteorological maps of Europe, with lines of equal pressure and information about winds, thereby enabling rough predictions to be made. This service developed rapidly, and became one of the Observatory’s principal activities, until it flew on its own wings in 1878. It is in fact the ancestor of Météo-France.